Printing on scratch-resistant metal provides a new alternative for presenting art, photographs, and imagery. Metal printing also represents one of the latest trends for digital printing for vibrancy and saturation. Printing on metal provides an added dimension to an image. Photos and art printed on premium, high-gloss aluminum has stunning vibrancy. They also pop with stark contrast which is unparalleled when compared to a paper printing. 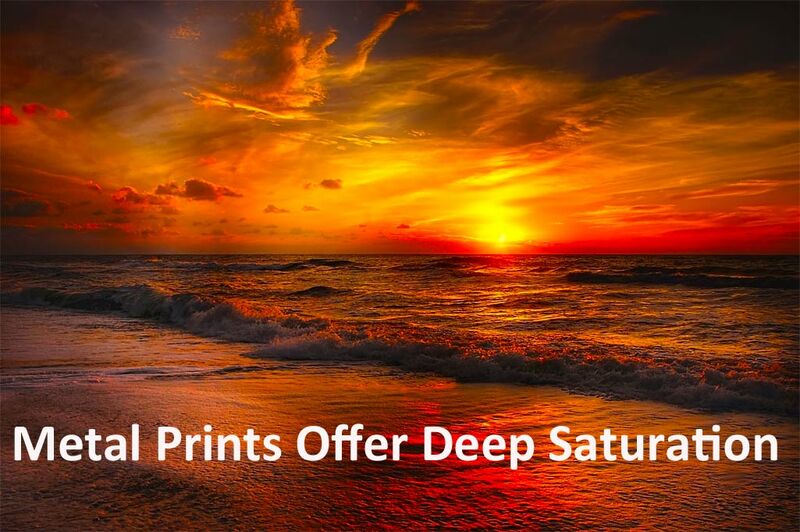 A metal print’s exceptional depth is often been labeled “jaw dropping” by our customers. The reason for the compliment is simple: The art is printed on high-gloss aluminum with rounded edges. This creates the effect of making the colors pop brightly. It also ensures the deepest contrasts for black and white printed images. Metal prints are the ideal medium for a variety of subjects including: pets, seascapes, landscapes, weddings, senior portraits, and art. Why Buy Our Metal Prints? Our lab utilizes a metal printing process that varies from other print labs in a number of ways. First and foremost, our lab uses dyes that are infused directly into the high-gloss aluminum. This creates a unique luminescent effect and true-to-life image clarity with stunning detail not found at other labs. Metal prints are affordable and durable. Prints made on metal and won’t easily scuff or scrape. They are weatherproof and waterproof. The prints are protected by a coating that is easy to clean with a microfiber cloth. Our scratch-resistant metal prints come ready to hang, with a pre-installed float mount frame on the back. Unlike most other metal prints, ours come standard with a recessed float mount pre-installed on the back. This allows you to display the art immediately. The larger metal prints come with an inset float mount frame with a nail groove. Smaller prints (8x10 & 8x20) come with a float mount, notched block hanger. In the case of both the large and small prints, each print has the appearance of floating ½” off the wall. All that is required is to place a hanger on the wall for mounting.